Finding the love of your life might have seemed easier than finding your wedding rings. For couples that like the look and feel of white gold or platinum, there’s a simpler solution. Our 8mm sterling silver high polish couple wedding rings make the process easier than ever before. These classic wedding bands shine bright like the love you have for each other, and you can save time, energy, and money on other elements of the big day. Every pair of our sterling silver high polish couple wedding rings is made from 92.5% pure silver and 7.5% alloying materials. Silver is often alloyed with copper, nickel, or zinc, to increase durability. We craft our rings with the highest level of craftsmanship. Call off the search and say “I do” with rings that represent the special bond you share. 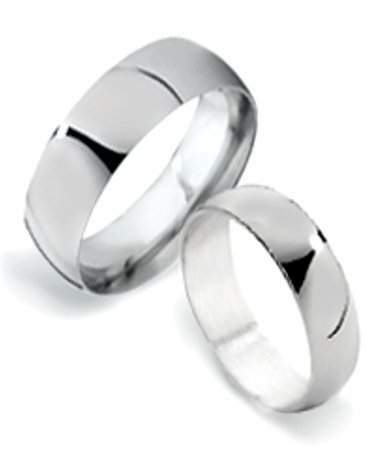 Our 8mm sterling silver high polish couple wedding rings, which is great news for grooms with large knuckles. Made with extra metal to create a slightly domed interior for all-day comfort, which is also great for men who lead active lifestyles or work with their hands. Before making your final decision, we recommend that you have your finger measured by a professional jeweler to determine whether a comfort fit ring is right for you and your lifestyle. 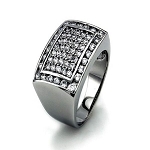 If you have any questions about our sterling silver high polish couple wedding rings, please contact JustMensRings.com today for additional information or further assistance. I bought this ring as a replacement wedding ring for my husband. He wanted a wider band in silver. I shopped many places, and decided on this ring. It is absolutely PERFECT. He loves it. It is comfortable and handsome on his hand. He never takes it off, and we are both very happy customers! Highly recommend! Beautiful ring for the $$$. Excellent customer service. Will definitely recommend to others. ordered this ring and received it in less than a week. ring was just as advertised, service was very prompt, and I am very happy. Absolutely beautiful ring. Originally bought it just to see what kind of style he might like when we get married... he hasn't taken it off since, so I guess that's taken care of!